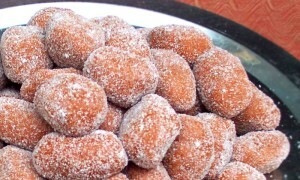 Dharwad Pedha: Dharwad pedha is a sweet delicacy unique to the state of Karnataka, India. It derives its name from the city of Dharwad in Karnataka. This sweet’s history is around 175 years old. Dharwad pedha is made of milk which is heated and stirred continuously, with added flavour and sugar. Dharwad pedha are also famous by the name of “Kandi Pedha”. These Special Pedas are generally made and offered in weddings. Finely chop the ricotta cheese. Pulse the chopped ricotta cheese either in a food processor or in a blender, until smooth. Melt ghee in a pan, on medium heat. Roast chopped cashew nuts till they turn little golden. Heat a non-stick pan, on low heat. Combine the milk, milk powder and ricotta cheese on a low flame by continuous stirring. Cook this for about 15 minutes, till the ricotta cheese slowly loses the watery consistency and takes on the khoya (mawa) consistency. It is very important to keep a close eye on the cheese to make sure that it does not get stuck at the bottom of the pan or burn. Add in little ghee and saffron soaked milk. Cook till the mixture is close to the khoya consistency and a sweet nutty smell comes from the mixture. Mix in half of the sugar and green cardamom powder. Let the mixture cool down for a while. Combine the khoya mixture with roasted Bengal gram flour, in a food processor. Process till the flour is incorporated well into the khoya mixture. Transfer the processed mixture back to the pan. Stir for a few more minutes. Continue to reduce this khoya mixture, on low flame, till the mixture turns light brown. Mix in the remaining sugar and be very careful at this point and do not let it burn. The khoya will become very granular and starts separating out. Once a nice brown colour is attained, add in the roasted cashew nuts and pistachios. Allow the mixture to cool down for 5-6 minutes. Start making balls from the dough. The mixture should still be a little warm at this stage. Take the sugar, for coating, in a bowl. Flatten each ball into the pedha shape. Roll the flattened dharwad pedha in the sugar and make sure both sides are well coated. Dharwad pedha is ready to be served. If you have any queries regarding the Dharwad Pedha recipe, please leave a comment.